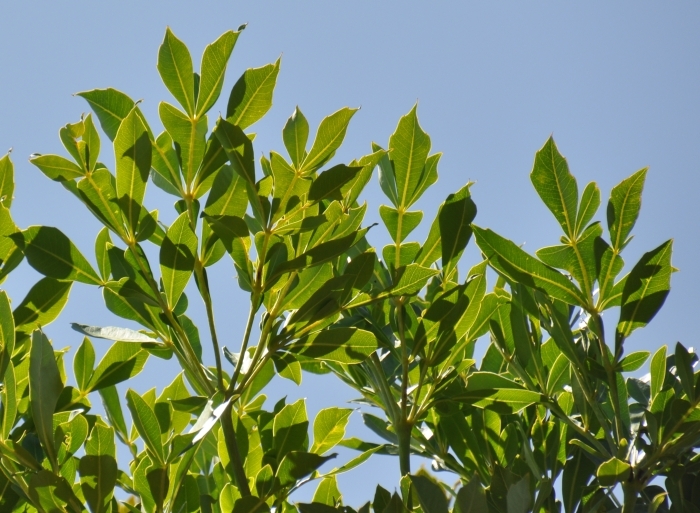 A highly ornamental, fast-growing tree, with rounded heads atop tall, slender stems developing into magnificent specimens, but don’t plant it near foundations or services. 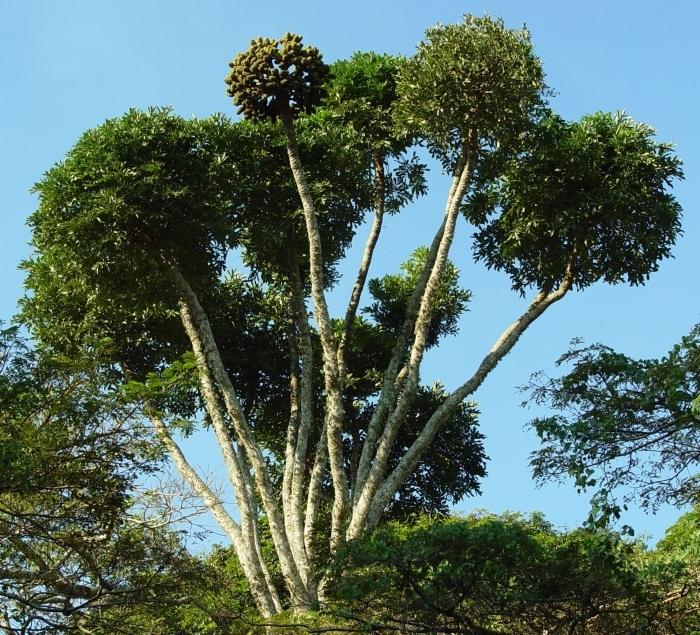 Cussonia sphaerocephala is a tall, slender tree, up to 25 m high. The main stem is straight, single and sparsely branched towards the top. 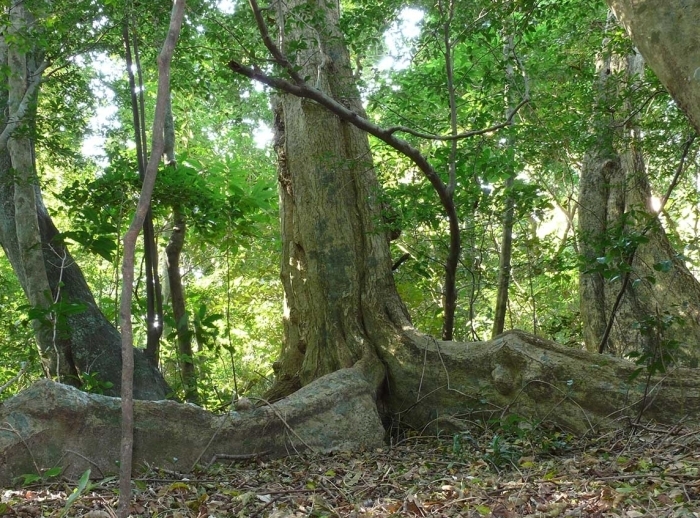 On larger specimens, the trunk is wider and fluted at the base. Each branch has a neat, dense, rounded head of leaves at the tip. Bark is reddish grey on young trees, maturing to dark grey, and smooth or slightly fissured to corky. The leaves are large, up to 400 mm in diameter, leathery, shiny dark green above and dull green below. The leaf stalk (petiole) is ribbed, and up to 900 mm long. The leaves are twice compound; the first division of the leaf is palmate, giving rise to 6–12 leaflets that fan out in a circular fashion from the top of the stalk, each leaflet having 1–5 joints, giving rise to pinnae with a pointed tip and petiolules that are triangularly winged. A new set of leaves are produced every year, and the old leaves drop soon after the new leaves have emerged. Leaf scars can be seen on the young trunks. The flowering behaviour is quite complex, and the inflorescence takes 2 years to develop. At first, an umbel of leafy branches is produced at the top of the main trunk, and each branch of this umbel has a knob-like thickened tip covered with large bracts. In the second season, the leaves drop, leaving these distinctive candelabras among the leafy crowns. The knob-like tips develop into the inflorescences, each one branching again into an umbel. The flowers are yellowish green, densely packed into short, thickset spikes, 80–140 × 40–60 mm, looking like candles at the tips of the short branches. Flowering is in autumn and winter (March to June). The fruits are fleshy, cone-shaped, up to 30 mm long and 1 mm in diameter, densely crowded on the spikes, green maturing to purple, and ripening from late winter into early summer (July to December). 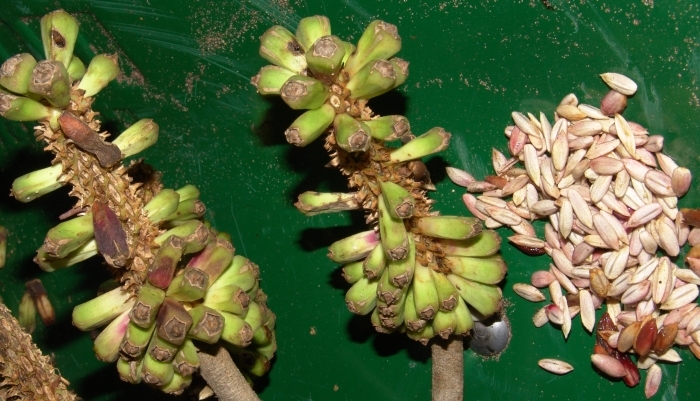 Each fruit contains a single seed, 10 mm long, and resembling grape pips. Cussonia sphaerocephala is not threatened and is assessed as Least Concern (LC) on the Red List of South African plants. Cussonia sphaerocephala grows in coastal dune forest and in moist, frost-free wooded mountain ravines, from the coast to the mistbelt at 1300 m altitude, in the Eastern Cape, KwaZulu-Natal and Mpumalanga Provinces of South Africa, and in Swaziland and southern Mozambique. It prefers southeast-facing slopes, and the rounded crowns emerging from the surrounding canopy are very conspicuous. The type locality for this species is Pigeon Valley Park, in the heart of the Berea in Durban, and the largest specimens are seen in Bulwer Park in Durban. They are a feature of the forest patches between Pietermaritzburg and Hilton. The genus Cussonia is named after Pierre Cusson (1727–1783), professor of botany at the University of Montpellier in France. This species is named for its striking spherical, terminal leaf-clusters, from the Greek sphaera, meaning ‘ball’, ‘globe’ or ‘sphere’ and cephale, meaning ‘head’. The Afrikaans common name kiepersol is a corruption of the Portuguese quita-sol, a name used for a light bamboo and paper parasol and applied to cussonias, on account of their umbrella-like crown of leaves. This species was named and described by Rudolf Strey in 1973. It had been erroneously referred to as Cussonia chartacea which was a misapplied name. C. chartacea is a synonym for Schefflera umbellifera. C. sphaerocephala was described by Aitken in 1923 as an ecological form of C. spicata. The genus Cussonia contains about 25 species that occur in Africa and the Mascarenes. There are 11 species in South Africa, and those most familiar to gardeners are the mountain cabbage tree (C. paniculata) and the common cabbage tree (C. spicata.). Cussonia sphaerocephala is an emergent species. It starts off its life as a seedling then a sapling in the understorey of the forest, and grows rapidly through the layers until it bursts out and emerges above the forest canopy. The flowers attract insects, mainly flies. The fruits are eaten by birds, such as Hornbills, Starlings, Doves and Turacos (Louries), and by Monkeys. The fallen bits are eaten by Blue Duiker and Bushbuck on the forest floor. It has thick, swollen roots that store water, making these trees very water-wise and well able to survive periods of drought. There are no records of Cussonia sphaerocephala being used in traditional medicine or being edible, however, its closest relative is C. spicata and for many years they were thought to be the same species, so it is likely that it is used similarly. The roots of C. spicata are used to treat fevers, uterine pain, venereal disease, malaria, nausea and as diuretics and laxatives and for bathing and weaning infants. 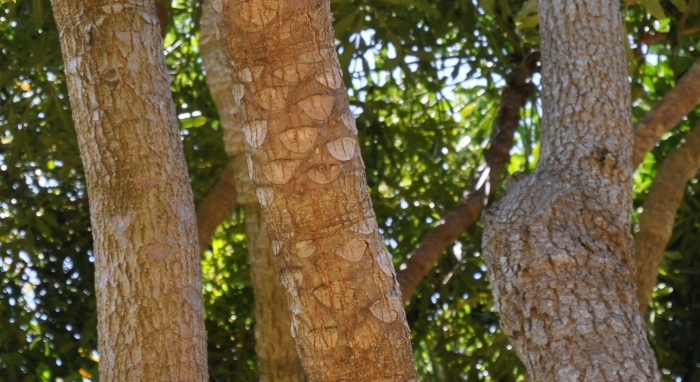 Bark is used for stomach ulcers and magical purposes. The roots are juicy and are peeled and eaten in times of famine, or chewed and the juice swallowed as a source of water in an emergency when water is scarce. The wood is soft and has been used to make brakeblocks, water buckets and drums. 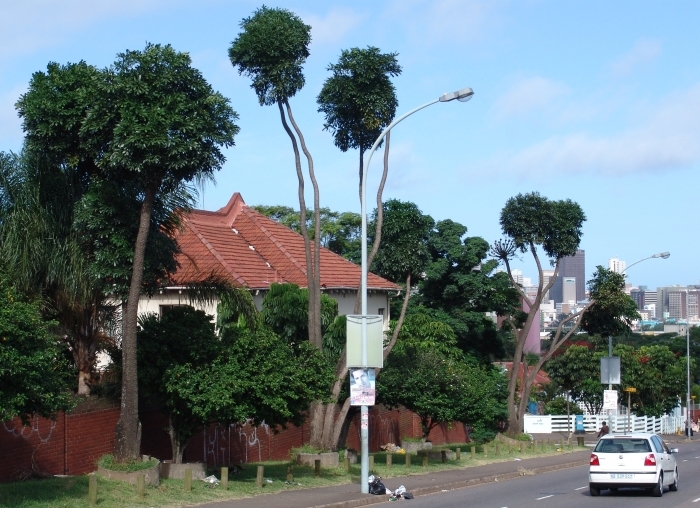 Cussonia sphaerocephala is a tall, fast-growing tree reaching about 12–15 m in 20 years on its home turf, in Durban. There is a grove of these trees in Kirstenbosch National Botanical Garden, in Cape Town, originally from the Ngoye Forest, that grew 9m tall in their first 20 years. It is best in a warm, frost-free climate, with plenty of water in summer, and deep, well-drained, fertile soil. It is hardy to mild frost, but needs shelter in the early years, until its head of leaves grows above the frost burn line. Plant in sun, semi-shade or shade, although it won’t spend long in the shade, but will shoot up in search of the sun. The roots are huge and thick, and will do damage to walls and foundations, and find their way into water pipes, so make sure to give these trees space, and plant them at least 4 or 5 m away from services or foundations. Young plants make wonderful container plants, but they will soon outgrow, and split, their pot in a few years. Cussonia sphaerocephala is easily propagated by seed. Sow fresh seeds in spring or summer, in potting soil and keep damp. Seed germinates after about 3 weeks and young plants grow rapidly. Strey, R.G. 1973. Notes on the genus Cussonia in South Africa. 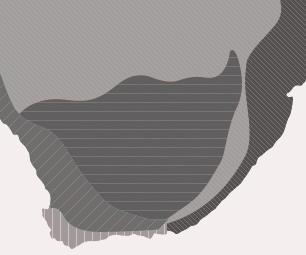 Bothalia 11 (1&2): 191–201. 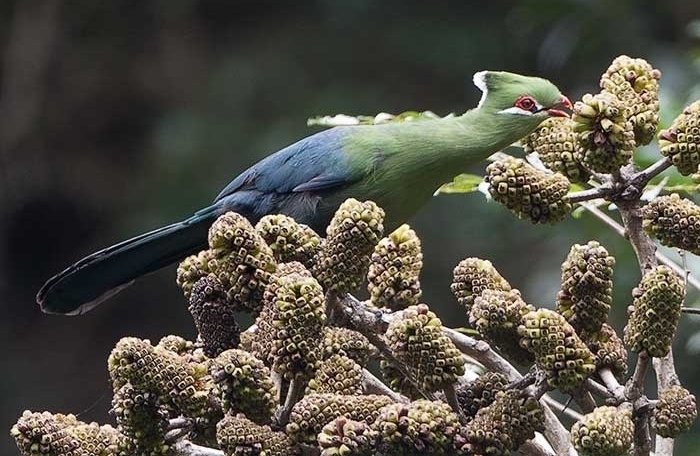 Acknowledgements: the authors thank Hugh Chittenden for allowing the use of his photograph of the Knysna Turaco eating the fruits.